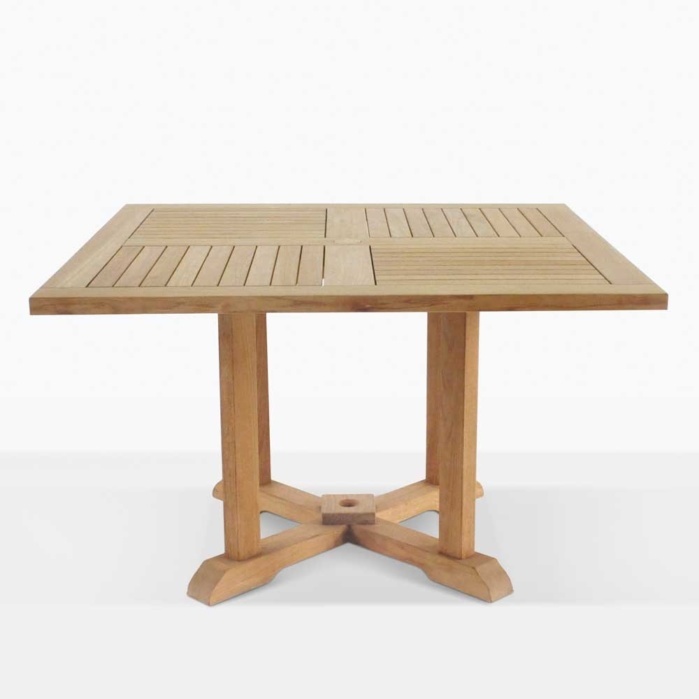 Classic and dignified; the Square Pedestal Teak Table is one of Teak Warehouses long-time best sellers and continues to be a popular choice for a fabulous outdoor dining table. The Square Pedestal Teak Table is an excellent choice for those who love quality, stability and time-honored tradition! Part of our classic collection of A-Grade Teak tables, the Square Pedestal Teak Table also comes in a Round version, both featuring a pedestal base, umbrella hole and a windmill design on the tabletop by way of tightly placed slats, all resulting an elegant design that suits any space. 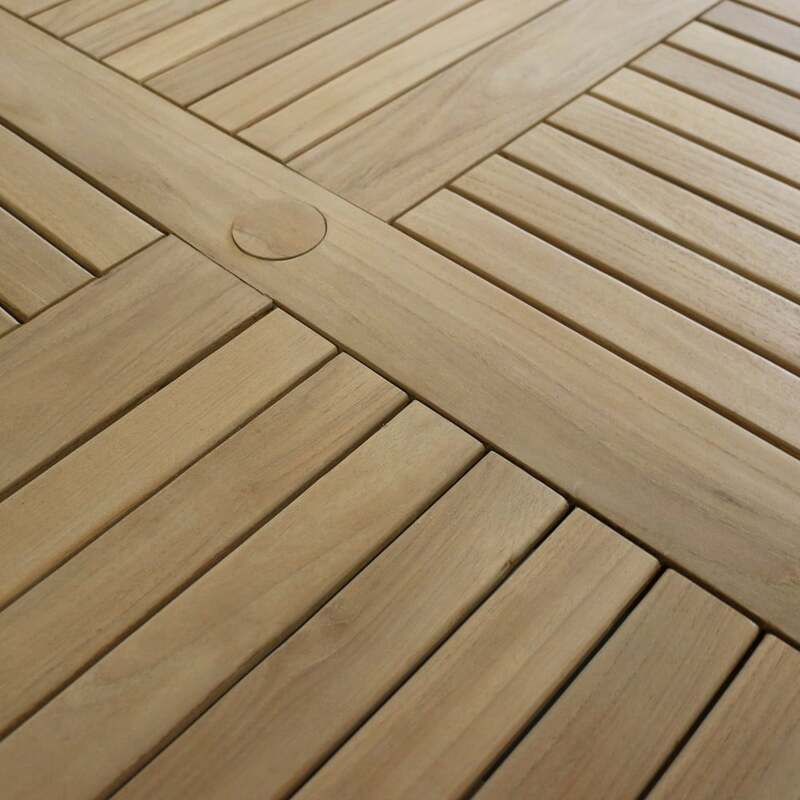 We are proud to use A-Grade Teak as our signature product here at Teak Warehouse, though we carry many other products now that are also marine quality pieces, look into our concrete, Batyline® mesh, #316 Stainless, Viro® All Weather Wicker and Sunbrella® products for more ideas! With our A-Grade you know your wood has come from a tree over 40 years old, meaning that it has had time to generate oil and rubber naturally creating wood products that stand the test of time. Grade-A Teak has been proven to be the best quality of wood for outdoor use, it ages beautifully, is hard wearing, and wards off those pesky wood eating bugs! This Square Pedestal Teak Table is ideal for outdoor dining. 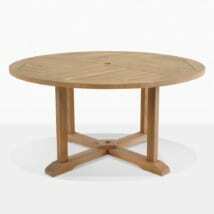 Our pedestal tables make a classical statement for your garden or patio. Mix and match with any of our dining tables for an eclectic space. 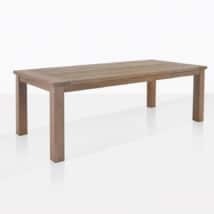 High quality construction and great sizing give you a plethora of options for this teak table and how you use it. This table is one which is perfectly content to be used daily for dining or tasks. After a shady breakfast area? If dinner parties are your thing, then purchase one of our other pedestal tables and mod-up the look with the addition of our fabulous Stainless Steel and Teak Chairs! You’ll love this mix of teak and marine grade Stainless Steel! Make an impact with a 47” Square Pedestal Teak Table and 4 concrete stools – get them in a square shape and you’ll be dazzled by the clever and contemporary design with a fabulous boxy look you’re sure to love. At Teak Warehouse, we have been supplying America with the finest outdoor furniture for over 20 years. We are proud to produce beautiful deep seating sets, accent tables, relaxing chairs, loungers, dining sets and options for shade and supply them direct to our clients homes, businesses, resorts, you’ll even see our incredible product on TV shows and movies! We are happy to offer our incredible line of products at wholesale prices and have picked the best white glove delivery services to make sure your pieces leave our warehouse perfect and arrive to you in immaculate condition. Call or email us now for a comprehensive quote including delivery costs and time frames. We are in store 7 days a week and love helping our customers find the best pieces to suit their homes. We work together with you, giving you options so that you can choose furniture that will be in your lives for a very long time! 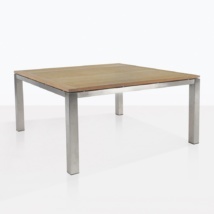 Clean lines and solid cuts of A-Grade Teak give the Square Pedestal Teak Table a robust yet urban feel. Imagine a garden, lit up at night with hurricane lamps and fairy lights, your favorite people are milling around, the scent of the barbecue is wafting over the ensemble, wine is flowing. Finally dinner is called, everyone sits down in their plush wicker chairs with a Sunbrella® cushion around your 58” Square Pedestal Teak Table and there you all remain for hours of wining, dining, laughing, listening… The ideal setting for wonderful nights of memory making. The Square Pedestal Teak Table is a must for those who love to dine in luxurious style, just pick a size that suits you and chairs that complement your home and you’ve got a brand new dining set to extend your living area to the outdoors.